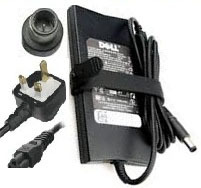 Genuine Dell Studio XPS Series laptop chargers are listed below; Dell Studio XPS series AC adapters come complete with battery charger and mains cable plug. The Dell Studio XPS series power adapter will charge your laptop while switched on, switched off or in sleep mode. If your battery has failed or been removed then The Dell Studio XPS series charger will simply power on your notebook so it can run from mains power.